'Slava's Snowshow' returns over Christmas in 2017. This review is of the show's 2014 run. Some people are wary of Christmas for good reason. Others – and this camp could really do us all a favour by giving themselves a stern talking to – bemoan things like 'the fuss' and 'those pesky pine needles that fall off the tree'. Well, even these embattled souls – as well as those more traditionally ga-ga for festive frippery – would find it difficult to withstand the full-bore Beckettian lunacy of 'Slava's Snow Show', an experience that doesn't as much blow away the Christmas cobwebs as blast them into cold, deathless oblivion. There are such familiar festive entertainments as balloons, clowns, snow, bubbles, but this is as far away from normal, practiced hogwash of childhoods yore as is imaginable. Bridled anarchy holds sway at every turn, and yet proceedings never trip over into silliness, indulgence or mindless mugging. Leading the line is veteran Russian performance artist Slava Poulin, whose quieter moments gives the show a precious respite in which to gather its energy for the next assault of roaming clowns, blaring opera music or – for the rambunctious, rapturous finale – a swirling, blinding blizzard of joyous, unconfined chaos. A blast. In every sense. What a perfect magical experience! Saw it with a three-year-old and my I-hate-clowns husband. We were all mesmerized, both by the simple poignancy of the smaller pieces and the sheer extravaganza of the interactive spiderweb, blizzard and balloons finale. Absolute joy! We went to see Slava's Snow Show yesterday and the whole family ( aged 7, 17, 19, 50 and 53 ) were blown away ! I mean literally blown away. I am quite a miserable Christmas hater but this was wonderful. Thankyou Slava. And you don't have to be a clown lover either. Slava's Snow Show is an incredible mix of childish fantasy, Brechtian melodrama and anarchic audience participation that always leaves me breathless. This really is one of the most beautiful and haunting events of the year - for clown lovers of all ages. Fantastic show for the festive season! My friend and I had an amazing time. 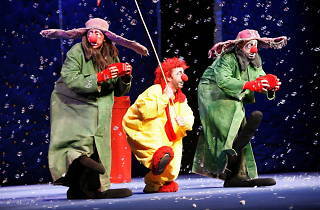 We were literally transported into a fun, poetic and a bit melancholic snowy universe with a group of colorful clowns. The show is a magical visual experience with many surprises such as the extreme weather condition expending into the audience. Don't try to understand the story as there is none. The show needs to be taken as a poem with no connection between the scenes - and let's awaken your inner child! Slava’s Snow Show is a huge surprise indeed. I wasn’t expecting to see anything like it. I’ve heard of the massive hype over the show, so it was fantastic to have had the chance to see it for the first time. We were welcomed into what sounded like a platform with many trains running along the tracks. It created the right ambience to start the show and give the the audience a chance to breathe it all in. I was transported into a land of snow and wonder. It felt very cold entering the auditorium. This show is definitely aimed for children. You can see it on their faces and their parents how excited they all are to see the show. They love to play around with all the confetti. You get to be children again for a night. It was all very funny and well created, but I felt it was rather all over the place. Extremely bonkers every second of the way and quite difficult to understand what was actually going on. I must admit that I laughed a couple of times. The songs and the confetti helped a lot. It is very messy the way the show is presented and the scenario was rather unprofessionally executed. The cast did an amazing job and put on a humorous production filled with excitement, but lacked something extra to make this an unforgettable experience for me. The clowns do anything and everything you can possibly imagine. They literally walk all over the audience, they throw snow at you, so be prepared to witness so many other fantastical surprises. Expect the unexpected with Slava’s Snow Show. Without ruining the surprise of this show, it will leave you wanting more and more. I felt a little upset by the quantity of the production. It needed more to finesse the show. The sticky cobwebs rolling on top of our heads was incredibly hilarious. I couldn’t stop laughing. The snowy blizzard was quite magical to witness and the gigantic balloons floating around us in the finale added a very unique touch to the end of the Snow Show. All in all it was a bloody blast of a show. I’d recommend anyone with children to book while you can. You won’t want to miss this. Royal Festival hall is such a wonderful place, I never doubt that I dislike like a show I see here. And what a wonderful show it was! It started of as a little odd and took a bit of time getting used to, left me and friend wondering if we wanted to sit through the whole thing. But just before the interval, be prepared It gets very interactive. Follow on a bit of journey with a clown/snowman and his friends (I think) through snow blizzards and wonderful different scenarios. Bits of interactive fun, of blizzards, huge giant balloons and lots of funny little laughs. Not just for the kids to enjoy, but definitely suited to family fun. I had a wonderful night and loved the ending. Weird, one of the most bizarre things I have ever seen! I wenrtwith a group of 4 of us and all of us thought the same! It starts off with a clown with a noose! I have no idea what the story line is, but the special effects were impressive!! The kids in the audience loved it, and the snow show at the end with big balls and snow, were pretty impressive. I don't think i would recommend this to anyone though, kids or adults! Like an episode of the recently acclaimed Blue Planet 2, this was very colourful and other worldly in parts. However, unlike the aquatic animals in that show, you never felt any sympathy for the main protagonists involved here. There were a few nice moments involving a coat and another involving telephones. The music was atmospheric in parts (Vangelis has never sounded so epic) and there were interactive elements that got the whole audience involved. Despite the laughter, especially from the younger members of the audience, I found the pace of the production eternally slow and the lack of a clear narrative bewildering. Bizarre and definitely for a younger audience, Slavas Snowshow is a great evening for the family. I have to admit I found it quite slow at points and couldn't say there was a plot line, however the special effects were incredible. They literally blast you with confetti and certainly live up to the title of 'snowshow'. Another highlight was when the clowns came rushing into the audience holding dripping umbrellas and causing a bit of mayhem. The kids clearly loved it and it did make good entertainment. However, I wouldn't see this again unless I was with children, I think it fails for adult entertainment. Ok ... so here's a secret ... I have always been curious about about this show.. when I visited the Royal festival hall a few years ago I witnessed children and many grown adults come out of the auditorium with a gleeful look which only a great show could've created!! I will say this... it is mainly aimed at children as there are parts that speak to them more so than the rest of us.. however the interactive parts of the show are pretty fantastic!!! The very last snow blizzard at the end makes it all worth it!!! Wow!! I doubt I'll see anything like that ever again!! Almost 24 hours after seeing this show and I still have a question mark inside my brain, asking me what on earth it was. It had absolutely no story line. I was puzzled throughout the whole 90 minutes. And more puzzled as I couldn't understand what the 2 girls sitting in front of us were keeping on laughing at. Some parts were funny, I don't deny it. But definitely not as funny as if it would make you laugh the whole time. It was actually quite sad. The only highlight of the show for my friend and I was the finale when big balls were thrown at the audience and people started playing with them. I don't want to say we didn't have a good time. It was an experience on its own. But it's certainly not a show I would recommend. Total Rubbish. Very melancholy. Whole show is clowns walking around the stage in trains. Seriously hard to believe that people get paid for such poor production. Very poor value. Save your money and go and see a lighter, brighter show in the West End. Me and my hubby have been on this show 3 years ago. Amazing show for someone who understands that the clowns are not only to make you stupidly lough. Slava Polunin is not the clown. He is an Artist. Taking my little son with me this time. Nice show but not for children. Too depressing... All clowns are in deep melancholy and the music is too depressing. I was expecting to be too childish but the story was all about loneliness and dealing with it. There a few funny moments, a spider/cloud trick at the end of the first part but the most impressive is the ending where snow covers the whole stage, there is strobe lightening and vangelis papathanasiou's music plays in the background. 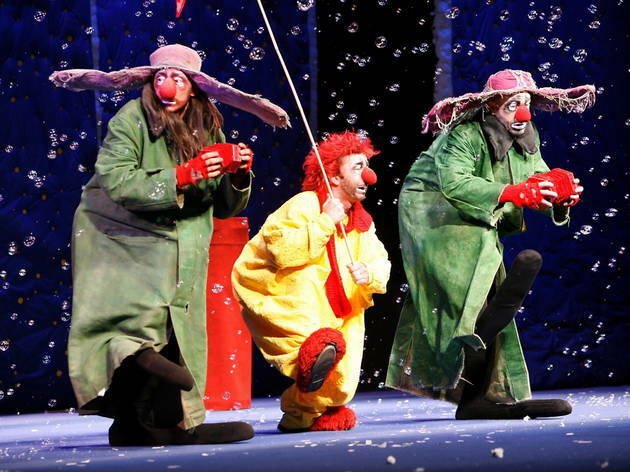 At the end of the show, some clowns stay on the stage throwing huge balls to the audience and playing with them (as seen in the attached picture!). Fantastic show! Don't believe the negative reviews below. This is a fantastic family show, my kids loved it. The seats we got from timeout were really good - fantastic value for money- just go. Time out is normally a trusted guide, but on this they were do off the mark. Dull and time wasting, a total rip off. For something aimed at children, it couldn't have been further off the mark. Does the time out reviewer know the meaning of Christmas or children's entertainment?! We spent £147.00 on a family of five seeing Slavas Snow show today ages 11 to 42. What a load of rubbish and a total waste of my money. I wish I could have got a refund! No one understood what was going on and a lot of people left half way through. Worst money I ever spent! I took my 10yr old son to see Slavas Snow Show..via time out offers..overall I found the show to be lacking in costume variety..weak story telling..performance..I found the whole show to be of minimal content on every level and the show was very short..not value for money in my opinion..lazy performance, unclear story lines, director did a bad job in making it child appropriate a bit serious..just wasn't simple fun..a bit dark and boring..with props that were rubbish..the only bit of fun was when there was a bit of audience participation ..would not recommend..even at the discount pice..
Utter mindless rubbish. What a waste of money. The snow show was average. There wasn't a clear plot, though certain scenes were amusing. The ball finale was memorable. Only clown lovers would find it all amusing . The show was quite good but I never really understood what was going on. It's a good show if you really like clowns.